Rebecca’s demeanor is quiet and introspective as she describes the circumstances that led her to Monarch Services. Despite some nervousness, she is determined to speak openly about her experience. She wants to be heard. Rebecca recounts the events that were the final straw for her. She remembers Joe driving the family home down Highway 1. He’s screaming, pounding the steering wheel, and hitting her in the face. She says he punched her in the face five times. His punches are close-fisted and hard, but she doesn’t remember feeling pain. He tells her he will kill her with the knife he keeps in the car, and she knows him well enough to believe him. Panicked, she gestures and waves to passing cars…. Fearing for the safety of herself and her 3-year-old, she seeks shelter at Monarch Services. The last seven years have been a living Hell for her. Rebecca was a prisoner, controlled by fear and chronic threats of abuse, isolated from people, and living in a remote cottage with no running water, electricity or phone. Her husband also confiscated her birth certificate, Social Security card, and driver’s license. Many may wonder how Rebecca could have even gotten herself into this type of dysfunctional situation in the first place. “Abnormality has always been familiar to me,” she says. Rebecca describes what is was like being raised by a mother with mental illness who was tormented by voices, frightening beliefs, and dark thoughts. Raised in this environment of chaos and fear, Rebecca learned to suppress her own needs and feelings and adopted a calm manner to accommodate and diffuse her mother’s psychotic behavior. After her stay at our confidential shelter, Rebecca expresses her gratitude. “The people here have given me so much strength and support. 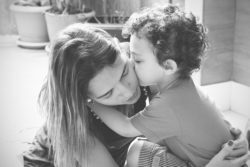 They’re the most loving people in the world!” Rebecca and her son eventually move out of state with the help of Child Protective Services and Witness Protection. She is nervous, but excited to begin her new life.